Your oven, like every other kitchen appliance, needs to be in a flawless condition to work properly and ensure the good taste of the prepared meals. If you want to be certain that your oven will be used a long time and function well, you can book our reliable oven cleaning services. They provide thorough and fast cleaning of the interior, exterior and all removable parts of your oven. Our cleaning technicians will dismantle some of the oven components and soak them in cleaning solution. 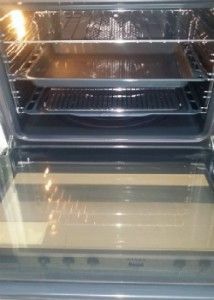 We can offer excellent oven cleaning services to all residents, living in and near Cricklewood. You can order them by phone, e-mail or by filling in the online booking form in our website. Cleaners Cricklewood is at your disposal seven days a week. If you rely on the cleaning technicians, working in our company to restore the cleanness of your daily used oven, it will look like brand new and work faster. Our technicians will take apart the removable components of your oven and soak them in non-caustic and non-abrasive cleaning solution. It will loosen and remove all obstinate stains from food, grease and carbon residue. The door of some ovens will be dismantled, so that the glass panels can be cleaned and polished till they become flawlessly clean. Use our services if you need professional domestic or commercial oven cleaning, and your property is located in Cricklewood. Check our affordable price rates. If your oven is dirty and needs professional cleaning, you can use our reliable oven cleaning services. They can guarantee you the better performance of your oven and its gleaming condition. Use our website or call centre to schedule your oven cleaning for any date and time, which is convenient to you. Our company is located in Cricklewood and works every day in the week, including at the weekends and bank holidays.